In a social web-based society into which today has transformed, content has proven to be the imperative factor and selling point of an up-to-date 2014 company. However, as Twitter describes itself as “The shortest distance between you and what interests you the most,” speed, in fact, rides shotgun in the importance of capitalizing on real time marketing. So how do companies proactively plan for unforeseeable conversations that occur on Facebook, Twitter and through the visual newsfeed of Instagram? One aspect which social technology has undoubtedly transformed, is the speed of virality and news – things are trending more and more to instant. When Whitney Houston died last year, the first press release announcing the story was, 27 minutes too late. An hour and a half after she was found dead, 61,227 tweets were being shared every minute concerning the subject. The microblogging network has transformed itself into a platform for virality, all brought together by a simple hashtag. Speed is a fundamental competitive advantage, which can see your brand elevate above your competitors by providing and engaging in conversation. In order to do so, brands are trying to be highly relevant and at speed and scale. A prime, and probably the most fitting, example of this materialized during the last Superbowl when the unthinkable happened and the lights went out in the stadium leaving only beer, chips and social media to fill the darkness. As numerous brands spent over $1 million on television advertisements to push their brand awareness upon the millions of watching eyes, Oreo leveraged the online conversation surrounding the #blackout (trending at 231,000+ tweets per minute) and transformed it into the perfect marketing opportunity. Although the previous two examples were unforeseeable circumstances, which no marketing team can precisely forecast, the first step to plan for real time marketing is to sett up a meticulous social strategy. Plan for Every Day Marketing Moments Missing out on unforeseeable happenings is excusable – no one expects a brand’s creative team to instantly come up with marketing gold 20 seconds after something unexpected happens. 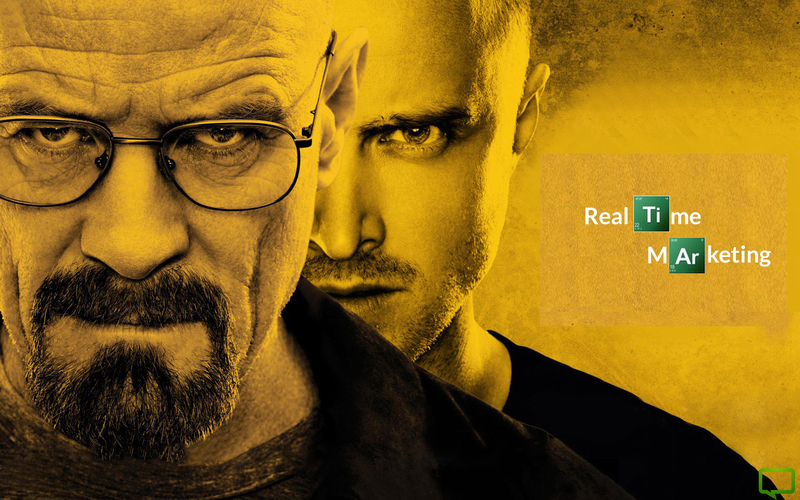 However a brand can easily plan for, and base a campaign around, everyday occurrences such as popular television shows like Breaking Bad, Sons of Anarchy & Boardwalk Empire. There is a huge conversation happening around today’s pop culture – engage in it! Create a Winning Content Calendar Once a brand’s foundational campaigns have been created, it is important to then stick with a calendar and to schedule these posts throughout the week. This gives you more time to creatively act upon the variable unexpected occurrences in today’s media! Scenario Planning Social Crisis Management will be ingrained into every company’s social strategy in the foreseeable future – too many faux pas and Oops! moments have transpired which has seen a company’s online reputation plummet. Lynx (the British version of Axe deodorant) featured in an episode of the British Documentary series, Dogging tales, which follows the lives of those who are nothing short of perverts and who conduct sexual acts in public. To sooth this crisis, the creative team at Lynx posted this the next morning – Crisis averted! Speed is The Differentiator Bringing everything full circle, no one would care if Oreo were to have posted its #Blackout tweet today, or tomorrow – it was the fact that they acted in the moment and created a relevant piece of content that sparked conversation. What was their advantage apart from the fact that there is hardly anything more delicious than double stuff Oreos? It was speed, speed, speed! Contrary to popular thought, a successful social brand isn’t one who posts regularly, but who post relevant engaging content (between engaging in trending social conversation). “Companies think of social as distribution, not as a place to natively tell a story” (Gary Vaynerchuk, 2013). Apart from popular television shows, how can your brand engage in real time marketing on social?